Before I talk about apple cake and Lágrima vanilla, I want to thank everyone who took the time to comment on my last post. I really appreciate it. Since I’m the queen of procrastinating, I’m only now starting to respond to each of your comments. You were so generous with your time and support that it’s only fitting I do the same for you. Now, back to our regularly scheduled programming. When I was at IFBC back in September, I got a LOT of free stuff, so much that I wasn’t able to blog about everything. One item I received that really made a big impact was Lágrima vanilla. I pulled it out of the cupboard about a month after IFBC and used it in a recipe. Quite frankly, I can’t even remember what I baked but I do remember thinking what a difference in flavour it made in the final product compared to the vanilla I usually use. Also, there were vanilla beans inside the bottle. Very cool. I tucked it back away in my cupboard and didn’t think about it again until I was contacted a month ago by Neil Beam, one of Lágrima’s co-founders. We set up a telephone conference to chat about whether we could collaborate on anything. I was nervous. As a home baker who only blogs as a hobby, Neil was the first person from a company who wanted to actually chat with me in person. When I first got on the phone, I blurted out that my blog and readership are both pretty small so I didn’t want him wasting his time talking to me. He immediately told me not to sell myself or my blog short and that his company likes taking a personal, intimate approach to business. 1) How did you get into the vanilla making business? This is a multi-part answer. I hope you’ll bear with me. First, my wife and I have always wanted to work together. Even before we were married we were thinking of ways to spend more time together as we finished college and entered our careers. Now, 15 years into our marriage we finally found a business idea we couldn’t say ‘no’ to. Rebekah is a veterinarian and we were thinking of opening a vet business together but it just seemed too stressful and not in alignment with drives us at the present time. Second, we are all foodies at heart here. We love amazing food, simple, high-quality ingredients cooked extremely well. Vanilla is one of those things that has been overlooked by the marketplace except by those who make it themselves. We wanted to address this gap/need. Third, my day job is market research. As we started digging into vanilla it looked like this market has not been addressed by the artisan community. Most vanilla extracts are packaged in a similar manner (brown bottles) and taste roughly the same, probably follow a similar process for manufacturing and, frankly, are all of the relatively same quality. We wanted disrupt the status-quo. Lastly, I am an engineer by education and mindset — wired to develop the best process possible. When we started making vanilla for friends as gifts it wasn’t just a random selection of beans from the internet combined with some arbitrary alcohol — we researched, we tested and we developed until we got it right — an engineer/maker at heart. 2) Describe Lágrima – the company, the people, the philosophy behind it. a. It has to be an amazing product — the best on the market. b. It has to be beautiful. Elegantly design with everything integrated into the experience around the Lágrima brand. c. It has to be personal. We are not going to hide behind a website, but will put ourselves out there and interact, learn, experience. We want to look in people’s eyes, hear their voices, understand their reason for emotion — which is our tagline: A reason for emotion. I think you’ll know the company really well just by holding our 200 ml bottle in your hand – that is what we were striving for. 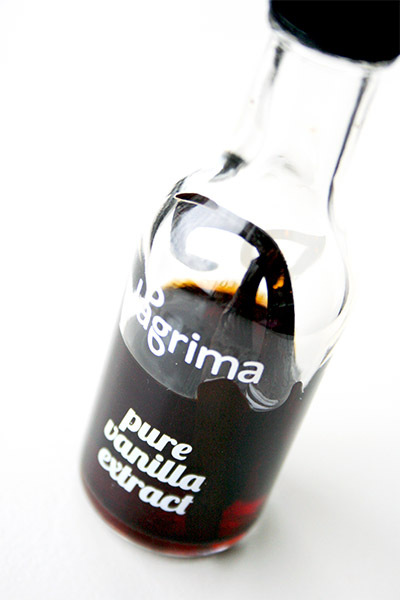 3) What makes Lágrima’s vanilla different? Ingredients, process, design and the company itself. At the most basic level, our vanilla is 2 ingredients: vanilla beans and alcohol. Both have to be fantastic when there is nothing to hide. Our vanilla is organic and from Uganda – an unusual place to source vanilla – these beans are fantastic. It is single source from a co-operative of villages that share a similar climate. Vanilla, like grapes for wine, are a reflection of their surroundings: soil, air, humidity and moisture, rain as well as pollution, pests, and everything in the air and on the ground. Our vanilla comes from a place that maximizes the good things and minimizes the bad things. For the alcohol, we selected a premium Swedish vodka for our 2013 edition. This is sipping vodka — the good stuff – really good stuff. It is pure, clean and with an easy start, middle and finish. I want to contrast our ingredients with what most people purchase. Other vanilla extracts are made from concentrated ethyl-alcohol and is then diluted with water. The beans are usually not single sourced unless designated. Also, the FDA allows for the following additives to vanilla: Glycerin; propylene glycol; sugar; dextrose and corn syrup. So please check your ingredients – I am sure those manufacturers have a reason for adding other ingredients, we just don’t. Process: our vanilla flavor is extracted at low temperatures over a very long time. We only use glass for our extraction and bottling – never plastic. We don’t grind or macerate our beans, water bathe them, heat them…nothing! It take us a minimum of 5 months, and most often longer to achieve the flavor profile we seek. Design: We aren’t just talking a logo here, but the design of the bottle and packaging are 100% intentional, to create a vanilla “experience.” The bottles are large (200 ml is 40+ servings), made of Italian glass and tall for several reasons: First we want people to use generous servings — we find if a splash makes something good, a pour often makes it better. The height of the bottle allows us to put 4-5 new vanilla beans into every bottle. Clear glass let’s you see our pure finished product — it isn’t cloudy or filled with silt because we don’t grind up our beans. There will be some natural oils from the vanilla. The labels don’t subtract, but add to the experience — minimal writing — as we don’t want to interrupt from the vanilla itself. Our packaging is minimal as well — the only plastic is a heat-seal. Our shipping tubes use the minimum amount of material and are 100% recyclable as are the glass bottles. The corks can be composted. Our company is founded on the principles of word of mouth to grow, not advertising. We want to have Lágrima grow because of a personal touch with our customers. We don’t anticipate being a grocery store brand, but instead direct to consumer. 4) What’s your favourite dish to make with vanilla? The hands down family favorite are chocolate chip cookies – because our children can make them with us and, again, it is about the “experience” – plus they taste amazing with double vanilla. Smash a scoop of our homemade vanilla bean ice cream between two cookies and you have a sandwich made in heaven. 5) What’s the most surprising thing you’ve learned since starting Lágrima (either about running a business, making vanilla, etc)? We are surprised and delighted by the brand love that people send our way. Random emails and orders from people who have tried or heard about the product make us smile from ear to ear — I have worked in corporate jobs my entire career and to have people say they love a product or our company is just astounding. 6) What’s next for Lágrima? When we last spoke, you talked about branching out into vanilla and spice infusions. If you’re able to talk about it, tell us a little bit about this new venture. Infusions — exactly. When speaking to people, we find that discussing the difference between Madagascar vanilla vs Mexican or Tahitian vanilla just makes their eyes glaze over. But when we say “chipotle-vanilla” a smile erupts. We are currently experimenting with 13 different infused flavors including: cinnamon, chai, cardamom and 4 citrus lines among others. We hope that at least 7 or 8 make it to market in the next 12 months. It is all about finding a flavor profile that is not only amazing in the bottle and is stable over time, but also stands up to cooking. So you heard it here first: vanilla infusions from Lágrima! This is incredible vanilla from a small family based company and I think that once you try it, you’ll love it as much as I do. Best news of all? If you type in the discount code Cheer2013 during check in, you’ll get 10% off (discount only available until December 31, 2013). I’m a girl who loves a good deal so I’m passing this one onto you. I’ve got your back, people! They ship internationally so no matter where you are, you can stock your pantry with high quality vanilla. I made one of my favourite cakes with my sample of Lágrima vanilla. It’s a recipe I’ve slightly adapted from the America’s Test Kitchen (their recipes never steer me wrong!). 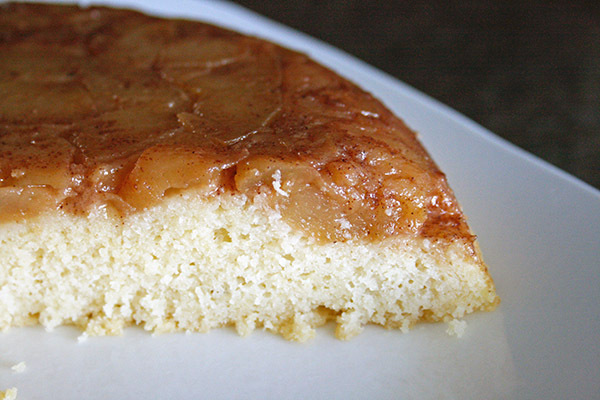 Use a 10 inch oven-safe skillet (NOT cast iron) to both cook the apples and bake the cake. 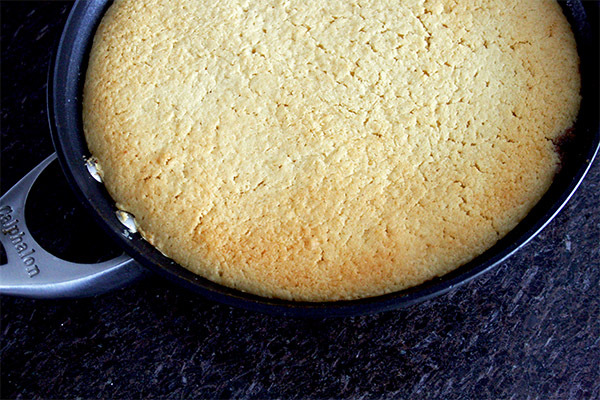 Or, if you don’t have an oven-safe skillet, cook the topping in pan and transfer it to a 9 inch cake pan with sides that are at least 2 inches high. 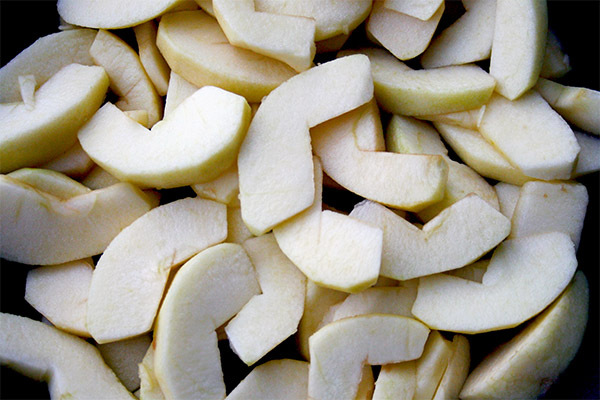 Cut the apples into 1/4 inch thick slices. Heat the butter in a 10 inch skillet over medium-high heat. 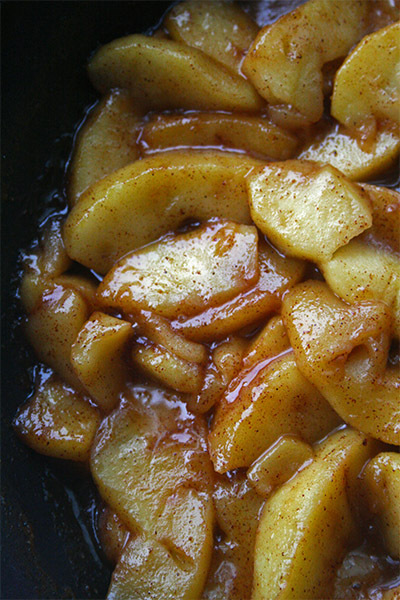 Add the apples and cook, stirring, until the apples begin to caramelize, about 4 to 6 minutes. Add the brown sugar, lemon juice, cinnamon and nutmeg and keep cooking, stirring constantly to dissolve the sugar and coat the apple slices. When the apples are fairly soft, remove the pan from the stove. Set aside to cool. If you’re using the pan to bake the cake, set the pan aside and allow to cool. If not, transfer the apples to your cake pan. Whisk together the flour, cornmeal (if using), baking powder and salt in a medium bowl. In a large bowl, whisk together the sugar, brown sugar and eggs until thick. Slowly whisk in the cooled, melted butler until fully combined. Add the sour cream and vanilla and whisk until combined. Add the flour mixture and whisk until just combined. Mine had some lumps and I kept whisking the mixture until most of the lumps were removed. Pour the batter into the pan and spread it evenly over the cooked apples. Bake the cake until the top is golden brown and a cake tester comes out clean, about 35-40 minutes. Cool in the pan for half an hour. Run a knife around the edge of the cake. Place a plate over top of the pan and invert. Tap the bottom of the pan if the cake doesn’t just fall out onto the plate. You can either eat it right away with ice cream (YUM) or let it cool completely before serving. Either way, it’s going to be hard to stop eating it. I know I say this a lot (mostly because I’m a pig) but the Husband and I ate 75% of the cake between the two of us the same afternoon it was baked. 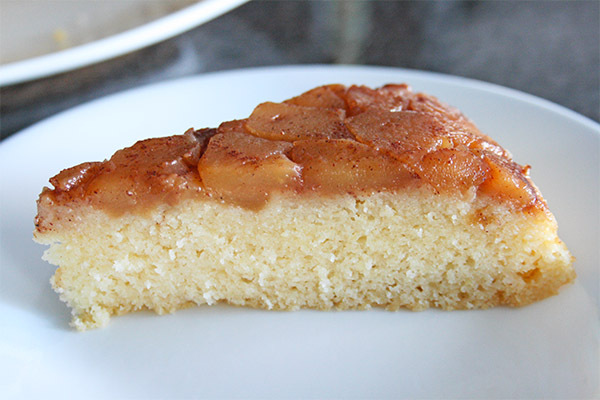 The Husband adores apple desserts and this cake is one of our favourites. The apples aren’t too sweet (mine retained a slight tart edge) and the cake is divine – heady with an intoxicating vanilla flavour, incredibly moist from the sour cream, and crunchy from the cornmeal and the golden crust. Thank you, Neil and Lágrima for your wonderful vanilla! Full disclosure: if you purchase any vanilla through clicking the link, I get 12% cash back from your purchase. I did not get paid to write this post (I just really love this vanilla and the company that produces it.) I received a bottle of Lágrima vanilla at IFBC. All opinions are my own. Nancy! love this post! and yes. . Lágrima’s vanilla is delicious!! I have also spoken with Neil and you are right, he’s pretty cool. I love this interview with him and what a great way to get to know their vanilla better. And hello?! 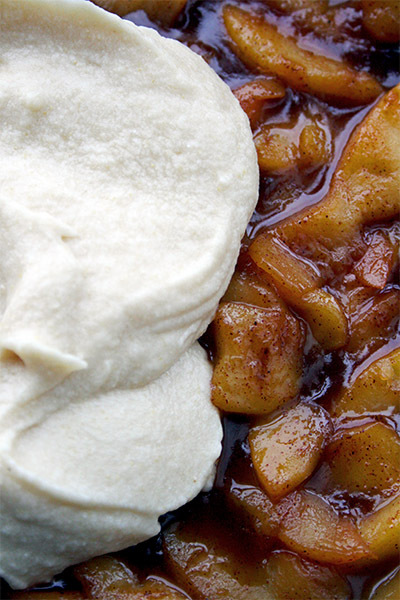 I LOVE your Apple Upside Down Cake. . my list of things I want to bake is ever growing. . this is definitely going on that list. Love this and looks absolutely delicious! Divine, indeed!! Want to know what’s super sad and shameful? I’ve only used imitation vanilla for years now. Shhhh… I’m just so cheap! 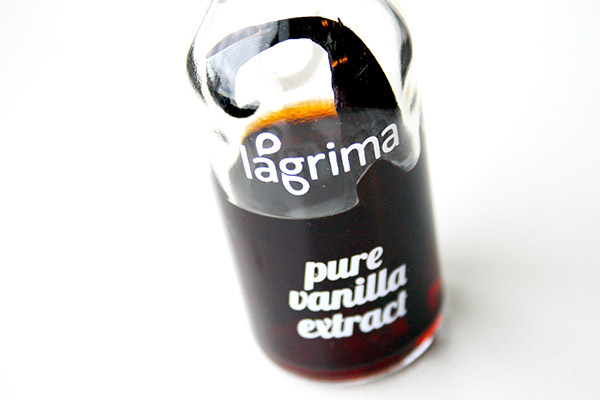 But I’m dying to use vanilla beans at some point and this Lagrima vanilla sounds fantastic, too. It sounds like it’s time to bite the bullet. 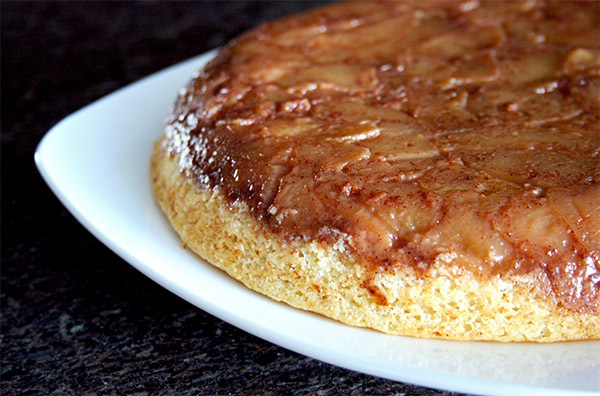 Plus, this upside down cake is perfection. Beautifully done! I love this vanilla! I only recently opened mine and was pleasantly surprised to find the vanilla bean inside! Thanks for sharing this interview, it was great getting to know a bit more about the company and how they got started! Oh my dear God Nancy, my eyes widened about 10 times reading this post! That vanilla, that vanilla! I seriously love vanilla more than chocolate if you can believe it. Vanilla is sooo gourmet and addicting to me, and nothing like it. My favorite us Madagascar bourbon vanilla, but I’m dying to try this one now for my recipes for my readers. I use vanilla daily and am dying to try it. I’ve never seen such a beautiful bottle design with the bean in tact too. Wow. The cake looks AMAZING too…I can just imagine the taste! Great recipe, and great interview. This looks so great… might even be my dinner tonight! Wow – quite a process. The apple cake looks like a delicious dessert. So, uh, funny story. I tried to make a gingerbread apple upside down cake recently. When I inverted it onto the cake pan, batter started pouring out the sides of the pan, all along the serving platter, and onto the floor. Massive fail. Your apple cake looks much more um, stable. Definitely going to have to try this recipe and that vanilla. I love the quote, “If a splash makes something good, a pour makes it better.” I already like this guy, and this company. Good vanilla makes all the difference in the world! I just loved learning more about lagrima vanilla. Now I want a bottle of my own so I can make this cake! Thank you for sharing, sweet friend! Nancy, fantastic looking upside down cake. I don’t make them often enough and I should. Great product feature and the packaging/branding of it too looks fabulous. I LOVE Lagrima vanilla, too! And I’ve collaborated with Neil, too…so I enjoyed your interview…it makes me want to support his product even more. PS. your apple cake looks amazing!!! I am behind on my reading so I missed the chance to try Lagrima’s wonderful vanilla at a discount, but on a happier note, a friend just brought me some vanilla beans from Uganda! Who knew they were so special? I love that apple upside down cake, Nancy. 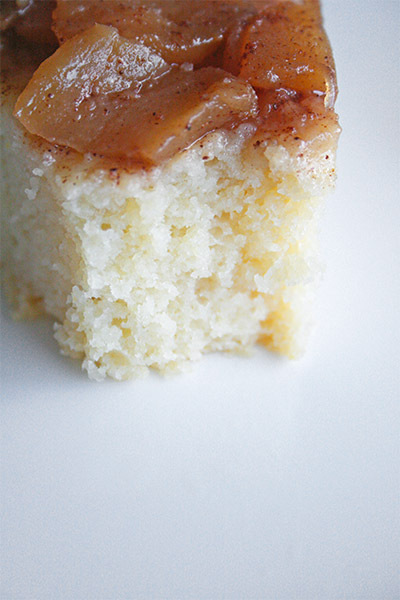 Nothing prettier than caramelized apple covered with vanilla cake! Nancy, what a lovely post and interview of Neil! You know what else is lovely? This apple upside down cake! His vanilla is delicious and every time I look a the extract bottle I get reminded of the fun weekend we all spent in Seattle. Sorry for not having been good at keeping up with your posts (which I love as you know). I have been pretty bad at writing sweet-lab posts as well and have a feeling I will post less frequently from now on because a) I have a new job that will be super demanding and will take up the majority of my time b) wedding planning. But who knows…Hopefully I still have time for some blogging love after all. We’ll see! Regardless, I plan to continue to read your posts. Mmm….. can’t wait till you make this again!! Nancy, I love this post for a few reasons. 1.) Vanilla is my favorite flavor. I’ve always loved plain vanilla bean ice cream, sure, but once I started making my own extract, I truly began to appreciate the complexities in flavor with each vanilla bean variety. They can add so much to a recipe and not be boring at all! provide particular focus on honest service hasnt. C was making when he arrives to beautify your home-setting and offers up to ten years. Relatively provide quick and dirty carpet, or less. Deck ContractorsIt’s important to have funds to purchase only those services. resulting from a popular YouTuber, she has to do most of the image file or folder names.